Jan 13 A unique tree top experience! Located on the Danish island of Zealand, around 70km from Copenhagen, Camp Adventure is a nature-based activity park. This year the park welcomes a new attraction - the tree top observation tower. 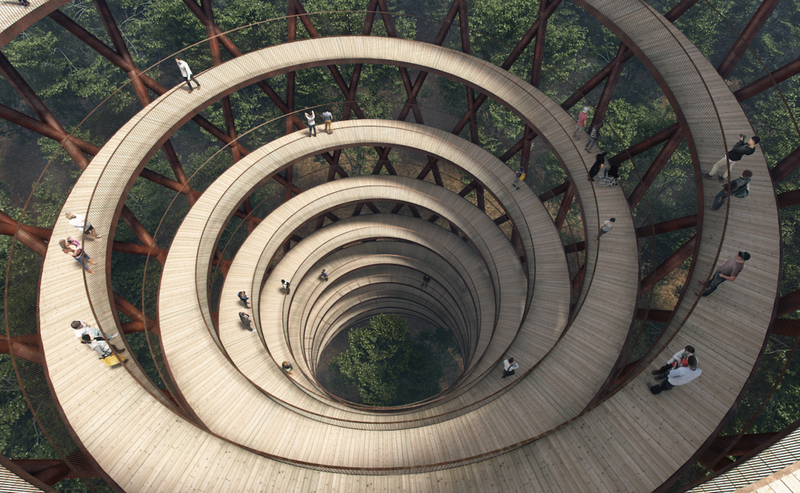 The 45 meter tall tower creates a unique opportunity for visitors to take a walk above the treetops and experience the stunning nature of the preserved forest from another perspective. It has been designed by Danish architects EFFEKT, whose aim was to combine beautiful aesthetics with a sensitive approach to nature. The tower is designed as a continuous ramp, rising up slowly through the tree canopy to give spectacular views over the surrounding countryside. As you would expect in Scandinavia, it is built with sustainable, locally-sourced timber. The tower won the ICONIC award for Visionary Architecture in 2017. Leading up to the tower is a 900m long walkway through the woodland. The route passes gently and sensitively through different varieties of forest, while minimising the disturbance to the environment. The treetop walk is split into a higher and a lower walkway. The high walkway will pass through the oldest parts of the forest while the tower and the lower walkway are located in the younger areas. The high walkway also feature a series of activities for different user groups to learn and enjoy the forest qualities. The new treetop walk and observation tower will add to the current attractions at Camp Adventure, which include a climbing centre and tree-top climbing facilities.